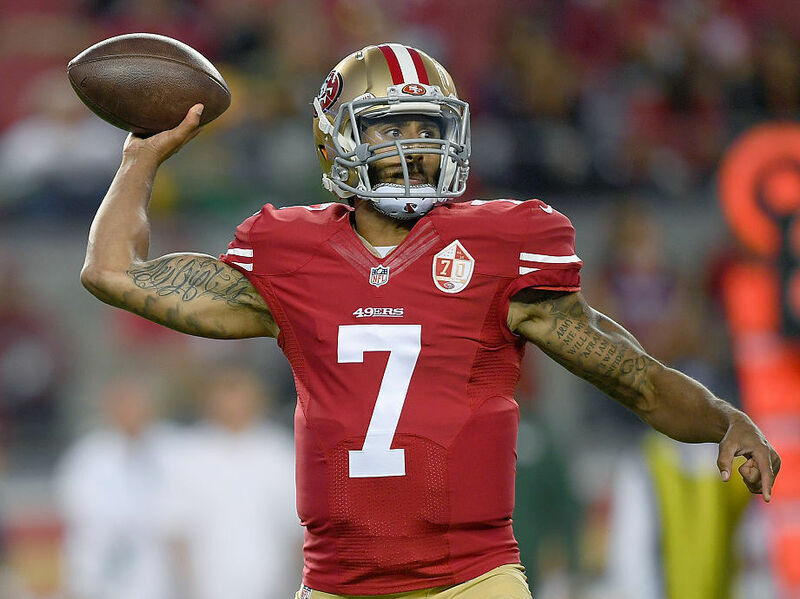 Colin Kaepernick, San Francisco 49ers QB, Sits Out National Anthem To Protest Minority Oppression : The Two-Way As players rose to stand for the national anthem at the 49ers-Packers game on Friday night, quarterback Colin Kaepernick pointedly remained seated. Quarterback Colin Kaepernick of the San Francisco 49ers throws a pass against the Green Bay Packers in the first half of their preseason football game on Friday in Santa Clara, California. "I am not going to stand up to show pride in a flag for a country that oppresses black people and people of color," Kaepernick said, according to NFL.com. "To me, this is bigger than football and it would be selfish on my part to look the other way. There are bodies in the street and people getting paid leave and getting away with murder." He told NFL.com that he did not notify the team in advance. "I am not looking for approval. I have to stand up for people that are oppressed. ... If they take football away, my endorsements from me, I know that I stood up for what is right," Kaepernick said. NFL.com reports that Kaepernick recently "decided to be more active and involved in rights for black people." Kaepernick's protest has drawn comparisons to a similar gesture 20 years ago from Denver Nuggets guard Mahmoud Abdul-Rauf, which generated a major controversy. He was suspended for one game and ultimately agreed to stand with his head bowed in prayer, as SB Nation reported. For example, Miami Dolphins running back Arian Foster wrote, "the flag represents freedom. the freedom to choose to stand or not. that's what makes this country beautiful." Later, he wrote, "protest is imperative for change. it invokes the conversation." Taking a different view, former Denver Broncos offensive tackle Tyler Polombus wrote, "Activists changed USA for better but have to associate Nat Anthem w/ military that die for ur right to protest. Stand up. Find another way." Wow the amount of people who agree with sitting during the national anthem is truly disturbing! we wonder why our country is in the toilet? !